Stilwell's 2019 Star Student Peyton Holston and Star Teacher Mrs. Isdell were recognized by the Clayton County Rotary Club February 27, 2019.
and what's going on in the classrooms. Stilwell School of the Arts continues to model excellence in academics through the arts. 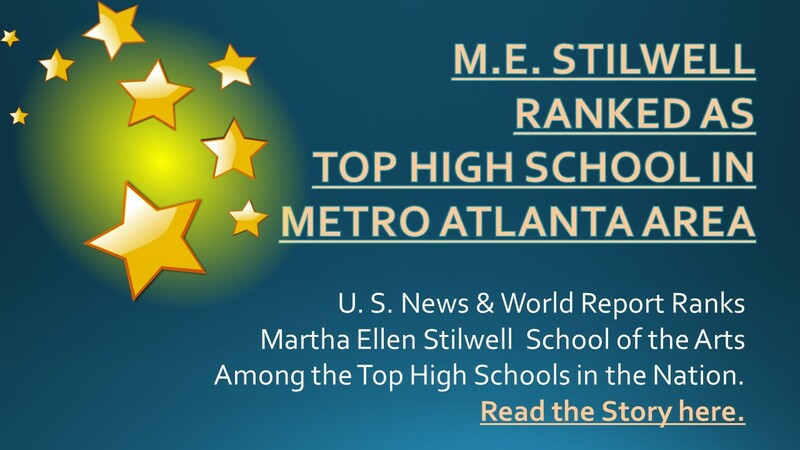 We are ranked amongst the top high schools in the State of Georgia for the second consecutive year by U.S. News & World Report. Congratulations to Ms. Sundararaj for being selected as the 2019 Magnet School of America Region III Teacher of the Year! Region III is comprised of Alabama, Florida, Georgia, Puerto Rico, and the US Virgin Islands. Clayton County Public Schools, along with Mitch Johnson with Primerica and Clayton State University, held the second annual high school Perfect Pitch Competition. Students delivered elevator pitches using effective communication strategies to sway the judges of their future career and/or college interests. Stilwell's team won second place. Congratulations to Ms. Rand along with Jovin Lawrence, Rajanae Jeffcoat, Makayla Moss (not pictured), Makaila Jackson and Brittany Grant. conference. Please find the link to the Singing Brothers of Stilwell's performance at the NSBA 2019 Conference in Philadelphia. Sophomore Cassie Hicks (see image below) won a gold medal at the state level of the Scholastic Art & Writing competition and has moved on to compete at the national level for a chance to win huge scholarships and the opportunity to show her work in New York, NY in the national art show. We had several other students win silver medals at the state level. Silver Key recipients had their work invited to the state level show in Savannah. Those students are: Zarah Brown, Raven Holloway, and Sky Johnson. And we had several state level honorable mentions: Michael Adaba 12th (2 pieces), Kylah Dixon 12th, Clemente Herrera 12th (3 pieces), Cassie Hicks 10th, Christy Lam 11th, Sabrina Martinez 11th, and Jordan Sims 10th. Congratulations to Cardell Smart for being awarded 1st place as the best male soloist in the State of Georgia for the past 2 years at the Georgia High School Athletic Association’s Literary Competition held at Veteran's High School in Kathleen, Ga on March 16, 2019. Cardell, Stilwell is proud of you! Congratulations!! Mrs. Sundararaj (Clayton County Public School's Magnet School Teacher of the Year) along with Peyton Holston, Joshua Copeland, Clemente Herrera (Stilwell School of the Arts) and Srirakshaa Sundararaj (Mt. Zion High School) presented their science research project at the Atlanta Science Festival Exploration Expo,Saturday, March 23rd in Piedmont Park. Congratulations to Sydney Williams for her 3rd place win in the 2019 August Wilson Monologue Competition. The National August Wilson Monologue Competition was founded in 2007 by Kenny Leon and Todd Kreidler at Kenny Leon’s True Colors Theatre Company in Atlanta. The national program is produced in collaboration between Kenny Leon’s True Colors Theatre Company and Jujamcyn Theaters. For the 3rd year in a row, Stilwell Literary Team has swept 6AA Georgia High School Association Regional Literary Competition!!!! The Literary Competition is compiled of several event in essay writing (rhetorical, argumentative, personal), extemporaneous speaking (domestic and international), oral interpretation (dramatic, humorous, duo), and music (boys and girls solo, girls trio, boys quartet). The team is compiled of sophomores, juniors and seniors and includes alternates in every event. Stilwell's Class of 2019 College Acceptance Tree is growing. We are beginning to see the fruits of our labor. Honor Schools acknowledging AP programs in six different categories. the six categories. Congratulations to our AP teachers: Mr. Lewis, Mr. McPherson, Mrs. Isdell, Dr. Graves, Ms. Mains, and Mrs. Crum ( Assist. Principal and Testing Coordinator). Stilwell Dance Repertory Company, are the Georgia High School State Dance Champions! This was the first ever competition and performance for the Stilwell Dance Repertory Company. We look forward to performing and growing with this dynamic group of young dancers. Congratulations! The Chorus Department, under the direction of Dr. Pace performed at the Jimmy Carter Presidential Library and Museum December 11, 2018. She was rewarded with a signed letter from President Jimmy Carter. Thank you for the hard work and dedication to Stilwell's Chorus Department. Congratulations to Nehemiah Wiggins on his performance this summer with T.I. on NPR's "Tiny Desk" Concert with the Atlant Music Project.